We are known throughout East Alabama as the destination for Fresh Quality Meats and low prices. Our Pick 5 Meat program consists of over 100 fresh, frozen and packaged items. 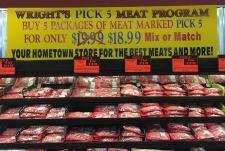 Simply purchase 5 packs of meat marked with the bright orange label for only $19.99. The largest selection and the lowest price in East Alabama. Wright's sells only the Finest Quality Fresh Meats. All of our beef, pork and chicken is 100% born and raised here in the USA. We do not sell any beef from Mexico like the big chain stores do. All of our meat is cut fresh daily by our experienced meat cutters. Our meat is not cut out of state and then shipped in like the big chain stores do. We do not add any sodium or solutions to our fresh meat like the big chain stores do. We will be happy to cut anything special for you.